Scores of Muslim Brotherhood members were arrested Thursday on terror charges, a day after the Egyptian government declared the group a terrorist organisation. In the Mediterranean city of Alexandria, prosecutors ordered that seven members of the group be detained for 15 days pending investigations over charges of belonging to a terrorist organisation, inciting violence and blocking roads. Among the seven arrested by the security forces was former lawmaker Mahmoud Ateya, a member of the Brotherhood's Freedom and Justice Party. In the Nile Delta governorate of Sharqiya, security forces arrested 16 members of the Muslim Brotherhood on similar charges. Head of Sharqiya security, Sameh El-Kilani, told MENA news agency that the suspects were distributing leaflets "promoting the ideas of the organisation" and "inciting violence." In the Nile Delta city of Zagazig, prosecutors ordered the detention of 11 Brotherhood members for 15 days pending investigations over charges of belonging to a terrorist organisation and the attempted murder of students and security guards, after taking part in university protests that descended into clashes. Since Islamist president Mohammed Morsi was ousted by the military in July following mass protests calling for his exit, his supporters have been facing a harsh security crackdown. Thousands of Muslim Brotherhood members have been detained, including Morsi and the group's top leadership. In a press statement on Wednesday, Deputy Prime Minister Hossam Eissa said the cabinet were formally declaring the Brotherhood a terrorist group, a declaration that has legal force. Eissa said the deadly bombing in the Delta city of Mansoura on Tuesday, as well as recent attacks on churches and other violent incidents attributed to members of the group had led to the decision. 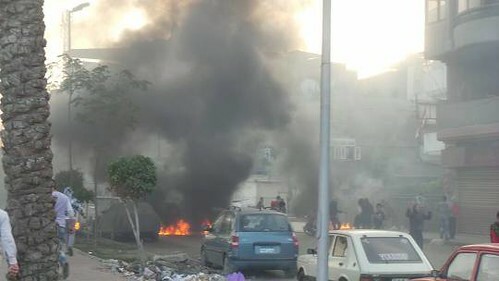 Sixteen people, mostly security personnel, died when a bomb exploded near Mansoura's Security Directorate on Tuesday. Sinai-based jihadists Ansar Bayt Al-Maqadis claimed responsibility for the attack, while the Brotherhood has denied any links to the bomb attack or other terrorist attacks.